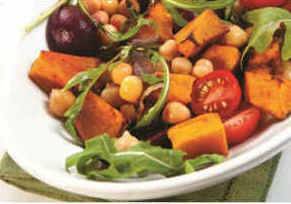 Chickpeas, roasted vegetables, baby beets, cherry tomatoes and angula - delicious! Second in a series (the first is On Picking Up Starfish) about what you can do to make a difference in a world that’s going to hell in a hand basket. A plant-based diet is lifesaving to you and to all the other animals. It’s not only liberating; it’s the one thing any of us can do to step away from the vast industry of cruelty and death that pervades the world, and to be part of a new way that’s founded in kindness and respect toward all living creatures. When I was growing up in London, England, we would take the train down to Brighton every few months, where my grandfather had a big apartment overlooking the English Channel. Grandpa was a Jewish immigrant who’d started out repairing shoes on the sidewalks of London’s East End. He’d grown a big shoe business out of that and, now retired, he would go to the synagogue in Brighton every morning ... and then come home to bacon and eggs for breakfast. Food customs are part of every culture. For some people, they’re unchanging. For others of us, we make them, we break them, we shed old ones that no longer fit us, and we adopt new ones that speak to who we are now. They’re part of how we define ourselves. President Gerald Ford called himself “a meat and potatoes man.” Southerners eat grits, New Yorkers eat bagels, and celebrity vegans in Los Angeles eat at trendy vegan-option restaurants like Craig’s, SunCafe and Café Gratitude. In the face of what’s shaping up to be a mass extinction of species, switching to a plant-based diet is the single best thing any of us can do to help.Whether or not you’re a celebrity, there are lots of good reasons to switch to a plant-based diet. On a personal level, as President Clinton discovered, it’s the best way to save your heart and protect your health. If you’re concerned about the planet, you quickly learn that animals raised for food put more greenhouse gases into the atmosphere than all the world’s motor vehicles combined, and that you can feed far more people on a plant diet than by feeding those plants to farm animals and then eating the animals. In a thirsty world, you save a huge amount of fresh water that way, too. When people ask me what they can do in the face of what’s shaping up to be a mass extinction of species, I always say that switching to a plant-based diet is the single best thing any of us can do. In the dominant meat-consuming ideology, foods are seen as existing on a hierarchy. Red meat occupies the top position, followed by white meat, dairy, eggs, fruit, vegetables, and then cereals. Red meat is the most powerful food because it contains blood which represents the life force of the animal. There is a common belief that consuming the muscle tissue of other animals creates muscle and strength in humans. ... Meat symbolizes power and strength and is associated with masculinity, whereas vegetables are perceived as inferior foods that are associated with femininity. That’s a view that recalls Aristotle’s scala natura, a hierarchy of nature with rocks at the bottom, plants on the next level, then various kinds of animals, and with humans way up top and only the angels and God above them. Hierarchies like these are ideologies, not realities. Meat isn’t superior to veggies, any more than men are superior to women. And when you abandon the whole meatocracy, it’s part of becoming a different kind of person. But don’t make the mistake of thinking that if you drop the red meat and eat more chicken, fish or cheese instead, then you’re making a difference. On another hierarchy, the hierarchy of suffering, dairy and eggs and chicken are right up there at the top. The life of a cow endlessly giving birth and having her calf taken away so her milk can be sold to humans is one of the saddest and cruelest things in the world. She has to keep on doing it until she can no longer produce babies and is dragged away to the slaughterhouse. Not that it’s any better for a mother pig in a cage where she can’t even lie down or turn around. Or for the hens who spend their lives laying eggs in a cage that’s the size of a sheet of writing paper. So best of all is just to skip all the animal foods altogether. And if you can’t quite go there all at once, you’re better off going plant-based one, two or three days a week, or for one meal a day, or whatever works for you, rather than trying to pick and choose between different kinds of animal foods. When Grandpa took up his eggs-and-bacon lifestyle in the 1950s, he saw it as liberating him from some of the traditions he was ready to leave behind. That was in a different culture at a different time. Today, it’s time to liberate ourselves from outmoded traditions that are now literally poisoning our planet and causing untold suffering to billions of animals a year. And you’ll know it with every bite you take.